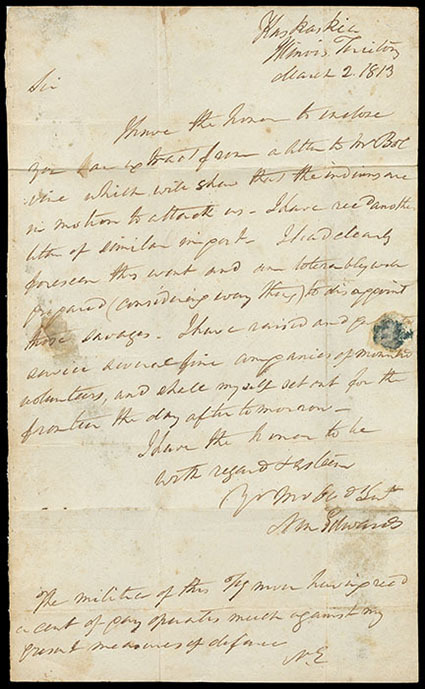 (Mississippi River - Arkansas Territory) 1809 (Dec. 23) Washington D.C. to Arkansas, Territory of Louisiana, folded letter datelined "Washington City 23rd December 1809" from John Treat to his brother Samuel recently appointed Indian Agent at Chickasaw Bluffs by General William Clark, some good content "…for unusual circumstances I have been requested to wait at first the arrival of the late Louis Ferris & after and Gen. Clark who two days ago reached here, therefore I probably shall leave this for Pittsburgh on my way down the Rivers…Also inquiring was of the same person if he remembers driving the two Dun horses in a sleigh, employed & transporting the public petry & furs in the neighborhood of Niagara, when two bales where wholly missing and also was at another time a barrel of whiskey which of course article to warm the stomach of a driver employed in transporting its if I remember right from shipping 10 or 12 miles…", Very Fine and early inbound letter. (Mississippi River - Arkansas Territory) "Arkansas 29 April", manuscript postmark and matching "25" cent due rating to Bangor Me., manuscript territorial postmark on 1828 folded letter to Bangor Me., interesting letter to writer's brother, mentioning bad weather including hurricanes, going to the lead mines in Missouri and "matrimonial affairs… still unsettled", Very Fine and rare territorial use. (Mississippi River - Illinois) Galena Ills. 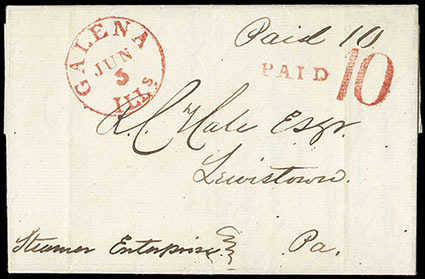 Jun 5, bold red cds with matching "Paid" and large "10" rating handstamps on 1850 folded letter to Lewistown Pa., endorsed "Steamer Enterprise" at bottom left, an Extremely Fine gem. 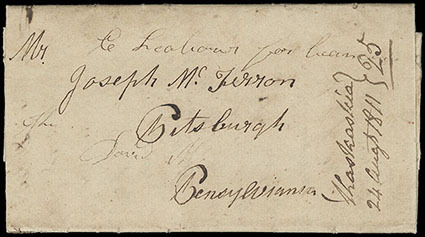 (Mississippi River - Illinois Territory) "Kaskaskia, 24 Augt 1811", manuscript postmark and matching "25" cent rating on folded letter to Pittsburgh Pa., enclosed letter from son to father tells of spring flooding by Mississippi River, deaths from fever, hardships and the ensuing settlements about Cape Girardeau (then part of Louisiana Territory); some soiling, F.-V.F., ex-Meroni. Kaskaskia was the site of the oldest town in the west first being settled by Jesuits in 1703 as an Indian Village and a Mission at the Mouth of the Kaskaskia River and its Junction with the Mississippi River about 60 miles south of Cahokia. Was taken over for the American Colonies by George Rogers Clark on July 4, 1778, from which point Clark moved to capture Vincennes in 1779. First became a post office around 1800 and later first Capital of Illinois Territory and first Capitol of the State of Illinois 1818-1820. Eventually completely destroyed by flooding. (Mississippi River - Illinois Territory) "Kaskaskia, Illinois Territory, March 2. 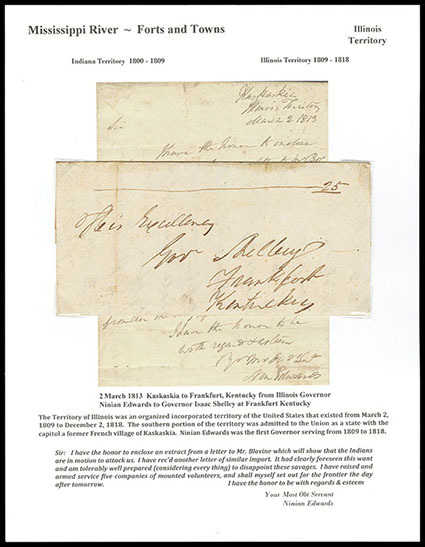 1813", dateline on ALS folded letter from Governor Ninian Edwards to Governor Shelley at Frankfort Ky. interesting letter reading, "I have the honor to enclose… extract from a letter to Mr. Bolvine which will show that the Indians are no motion to attack us - I have recd another letter of similar in part - I had clearly foreseen this want and an … to disappoint these savages. I have raised and … service several fine companies of mounted volunteers, and shall myself set out for the frontier the day after tomorrow"., Very Fine. AN EXCELLENT LETTER FROM ILLINOIS TERRITORIAL GOVERNOR NINIAN EDWARDS MENTIONING INDIAN WARS TO KENTUCKY GOVERNOR SHELBY. The Territory of Illinois was an organized incorporated territory of the United States that existed from March 1, 1809, until December 3, 1818, when the southern portion of the territory was admitted to the Union as the State of Illinois. Its capital was the former French village of Kaskakia and with Ninian Edwards as Governor. Governor Isaac Shelby was in office from 1812 to 1816. 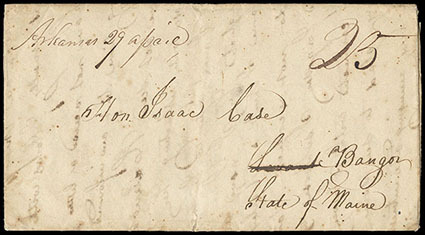 (Mississippi River - Iowa Territory) "Davenport W.T., Oct. 4th 1837", manuscript postmark with matching "25" cent rating updated to "50" cents to Robert T. Lytle, Surveyor General of the U.S., Cincinnati Oh., letter datelined "In Camp" concerning non-payment of $17.00 draft sent several weeks ago, Very Fine. 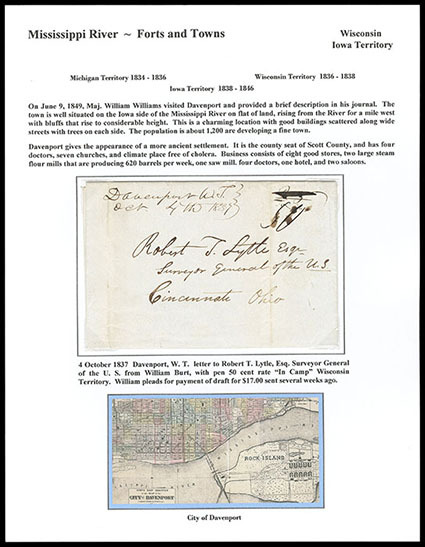 On June 9th 1849, Maj. William Williams visited Davenport and provided a brief description in his journal. The town is well situated on the Iowa side of the Mississippi River on flat of land, rising from the River for a mile west with bluffs that rise to considerable height. This is a charming location with good buildings scattered along wide streets with trees on each side. 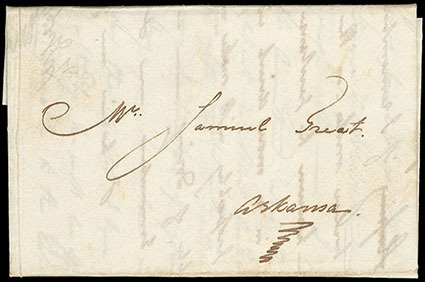 (Mississippi River - Iowa Territory) "Fort Des Moines, 12th June", red manuscript postmark on tan buff 1836 folded letter to Col. Geo. W. Jones, House Representatives, Washington D.C. endorsed "Free", some interesting content from Postmaster C.A. Carter "…The dragoons under Capt. Summers, Boone & Browne left this on the 7 & 6 inst for Green Bay via Chicago they visit will extend to the Winnebago s. Col. Kearny is at Fort Leavenworth this your friend Shamberg left this week for New Orleans & has made a conditional resignation at the request of Capt. Brown…In a recent visit to Fort Madison I regretted to learn that the appointment of Mr. Berg as P.M. was unpopular…The Mail between this & Fort Madison is not yet carried for lack of instructions from the Dept…", Very Fine, ex-Jarrett. The Fort Des Moines military post was located on the west side of the Mississippi River at the north end of twelve miles of rapids near the junction of the Des Moines River. The end of the Black Hawk War in 1832 opened a large area for settlement, which was later transferred to the Iowa Territory in 1838. The frontier was expanding after the war and Lieut. George Crossman was assigned to build a fort in 1834. The location was selected to include a steamboat landing for incoming supplies. Lieut. Crossman was assisted a shorter time later when Lt. Col. Stephen W. Kearny with 150 men of the 1st Dragoons. The fort was built without a stockade as the Indians were peaceful during this time. 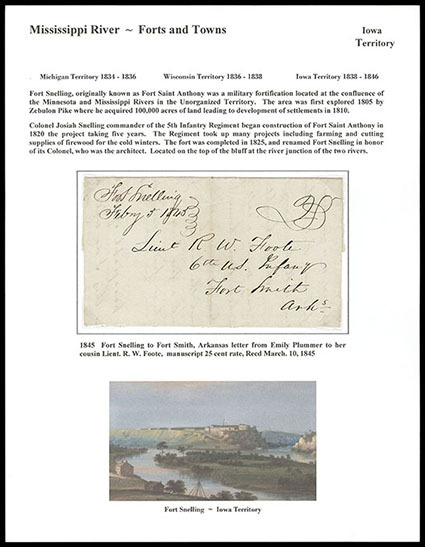 (Mississippi River - Iowa Territory) "Fort Snelling, Febry 5 1845", manuscript postmark with matching "25" cent rating on folded letter to Lieut. R.W. Foote, 6th U.S. Infantry, Fort Smith Ark., docketed on reverse "Rec'd Mar. 10. 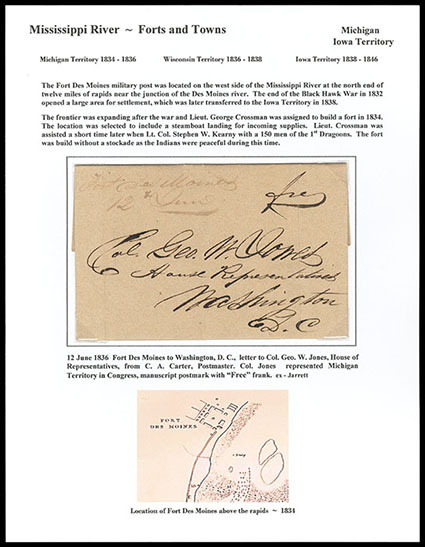 43", letter from Emily Plummer and Capt. husband to her cousin Lieut. R.W. Foote including "…I shall send to Ft Smith trusting to the good management of the Post Office Dept for its reaching you in safety - How do you like the idea of forming the reserve with the 1st next spring at Jefferson Bks? I suppose you will be delighted at leaving Arkansas. ", Very Fine. Fort Snelling, originally known as Fort Saint Anthony was a military fortification located at the confluence of the Minnesota and Mississippi Rivers in the Unorganized Territory. The area was first explored in 1805 by Zebulon Pike, where he acquired 100,000 acres of land leading to development of settlements in 1810. 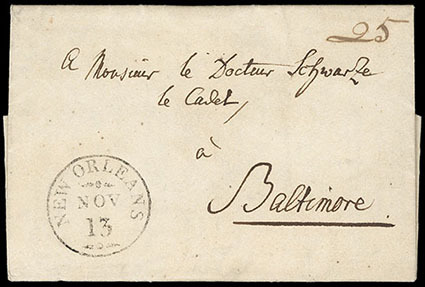 (Mississippi River - Orleans Territory) New Orleans, Nov 13, clear complete strike of cds and manuscript "25" cent rating on 1806 folded letter to Baltimore Md., Extremely Fine.